It’s almost the holidays, and that means plenty of leftovers! But you don’t have to settle for simply microwaving the same food over and over. 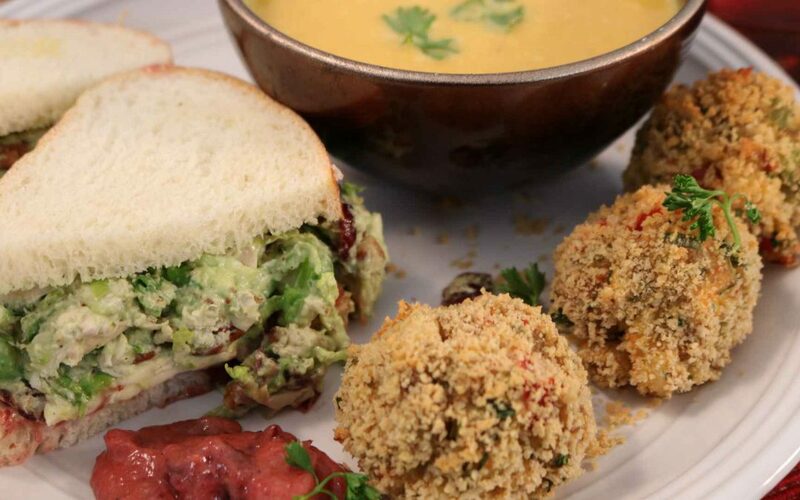 This “redesigned” Thanksgiving dinner is the perfect solution to leftover déjà vu. With a few moments of preparation, you’ll find yourself enjoying some elevated, extra-special Thanksgiving leftovers. 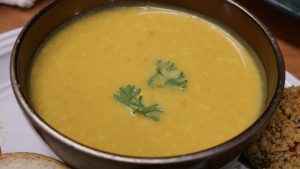 Turn root vegetable leftovers into a delicious Roasted Roots Vegetable Soup. 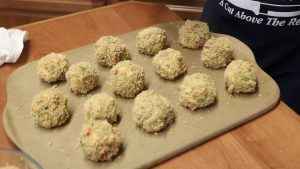 Transform leftover stuffing into a delightful Shrimp Croquettes that make the perfect side or appetizer. 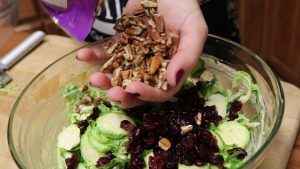 A Turkey Avacado Cranberry Salad that can eaten alone or as a sandwich. 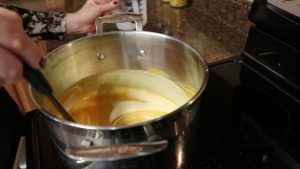 Blend root vegetables 1 cup at a time, gradually adding chicken broth to thin. Add to pot and simmer. Add seasonings and half and half. Simmer further, stirring as it cooks. Sautee’ garlic, celery, and pepper in a pan. Combine with remaining ingredients except Panko bread crumbs. 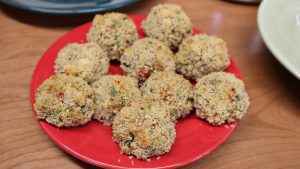 Roll mixture into balls and coat in bread crumbs. Spray with extra virgin olive oil and bake at 425 for 20 min or until golden brown. 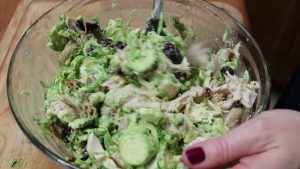 Combine turkey, avocado, and Brussels sprouts. Stir thoroughly. Serve on a sandwich or just eat as a salad. Mix thoroughly. Serve as a dipping sauce or as a spread for sandwiches. The Rada Non-Scratch Spoon is a utensil that’s perfect for preparing and serving your favorite recipes! Featuring a non-scratch material that’s safe for use with non-stick pans, it makes stirring and serving all sorts of foods a breeze. The study metal stem won’t break, while the flat nose makes for easy stirring and serving. Use it to prepare turkey cranberry meatballs, vegetables, casseroles, soups, and so much more! The Non-Scratch Spoon is backed by a Lifetime Guarantee, and, like all Rada Cutlery products, is proudly made in the USA. Rada Cutlery has been the partner of choice for countless nonprofit and charitable groups since 1948. By partnering with Rada Cutlery, your fundraiser has a number of advantages that will put it on the road to success. Churches, schools, civic organizations, charities, youth groups, sports teams, and so many more nonprofits meet and exceed their financial goals with Rada! 1. Products People Actually Want – Rada Cutlery offers 26 pieces of cutlery, 21 kitchen utensils, 42 cookbooks, and six stoneware baking pans. 28 gift sets are perfect for any occasion, while 43 scrumptious Quick Mixes make incredible dishes with ease. All cutlery, utensils, and gift sets are backed by a Lifetime Guarantee! 2. Huge Profits on All Sales – Rada Cutlery fundraisers give your group an incredible 40% average profit on items sold! This unusually high profit percentage ensures that nonprofit groups partnered with Rada do better than they ever have before. 3. Incredible Customer Service – Fundraisers are known to rave about the unbeatable quality of Rada’s customer service. Rada is a company built on fundraising, and it shows in every way. Our friendly, knowledgeable representatives are committed to helping each fundraiser be a success! 4. Three Ways to Sell – A Rada fundraiser offers not one, not two, but three sales methods, each designed to maximize your group’s profit! Catalog sales is a tried-and-true method that allows your group to offer catalogs to friends, family, neighbors, and coworkers. Event sales feature a personal touch, taking advantage of friendly crowds and physical interaction with our stellar products. Online sales utilize the power of the Internet to allow fundraisers to make easy sales to supporters close and far. Use one, two, or all three methods to earn money for your cause, utilizing whatever takes best advantage of your group’s strengths. Check out Rada’s new fundraising catalog! 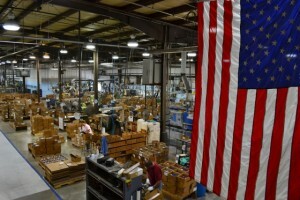 Everything Rada Cutlery offers, from knives to utensils to stoneware pans, is 100% made in the USA! Rada’s products are made by American workers who settle for nothing less than perfection. When you offer Rada for your fundraiser, you’re not only helping people acquire a fantastic product, you’re supporting American industry! Hi, Jess in the Rada Kitchen, thanks for joining me, today we are going to make a meal using leftovers from our Thanksgiving feast. We are going to start with a creamy roasted root vegetable soup. 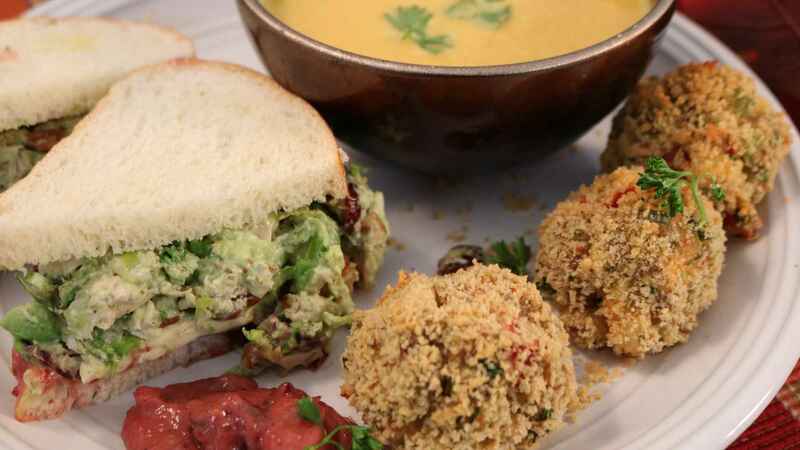 Follow that up with our shrimp croquettes, made out of our leftover stuffing, and then a turkey avocado salad using shaved Brussels sprouts and cranberries. We’re going to start today with our soup. So we’re going to liquefy all of our ingredients with our blender. 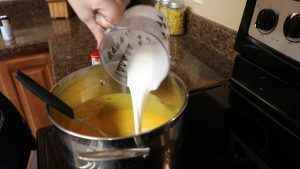 You can use a food processor or emulsifying blender as well. I’m going to put 2 cups of chicken or veggie broth in. I have some leftover roasted carrots, roasted sweet potatoes, and butternut squash that we’re going to use in our soup. You can use any combination of vegetables that you like. I’m just going to do a little bit at a time so I can make sure they all get nice and creamy in the blender. So we’re going to add some more of our vegetables and then go ahead and puree that as well. So I’m adding some more chicken broth and we’re going to keep layering back and forth, the chicken and the vegetables. We’re going to use about a quart of chicken brother and 3 cups of vegetables, about as much as you have left over. Alright, so you can see my soup is nice and thick at this point, and that’s how we want it, because we’re going to transfer to our stove or pot so we can have some half and half, or even cream or coconut milk if you want a vegan version of this. So, adding our soup to our pan or our pot. Now, our vegetables already had some seasoning on them such as cinnamon and some nutmeg so you can add that in at this point if you haven’t had them seasoned yet. All that goodness in here. And to that we’re going to add some sea salt, some pepper, and a little bit of curry powder. About a quarter teaspoon to start. And give it a stir. Just to make our soup a little creamier, I am adding 1 cup of half and half to this. And we’re going to let that simmer on medium-low. Alright, we’re going to go ahead and start on our shrimp croquettes. I have some leftover shrimp from our shrimp cocktail, it’s already cooked, I’m going to set it aside. You want about 3/4 pound or so. And my leftover stuffing, cornbread stuffing, would be fabulous with this, but use whatever you have on hand. And then we are going to add to this just a few vegetables that we are going to sauté in the pan. You want this red pepper in small pieces so it will blend nicely into the batter that we make. 2 stalks of celery, and again, thinly minced. 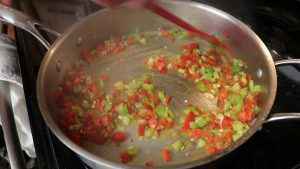 Now my pan is nice and hot here so we’re just going to sweat our celery and red bell pepper with a little bit of garlic. So now we’re going to chop up some of our green onions. Let’s chop up our shrimp. Looks good. A little bit more. So here we have our veggies that I pulled off the stove, we’re going to put those in our bowl. Don’t drop it! There we go. To that let’s get our shrimp in. Those chopped green onions. Then about a cup or so of our stuffing. You can add crab to this. That would be delicious. If you had some salmon or whitefish in here that would be great. To this I’m adding half a cup of Parmesan cheese and a fourth cup of mayonnaise. So now we’re going to go ahead and chop our parsley. Okay, we’re ready to mix up our filling. I’m going to add that parsley, 1 egg, and half a teaspoon or so of seafood seasoning. Give it a mix. Let’s go ahead and assemble these. We’re just going to take a scoop of that shrimp mixture, roll it up, give it a dip in our Panko bread crumbs so it’s nice and crispy, and then onto our baking sheet. Okay, so we are ready to pop these guys in the oven. I’m just going to spray it with a little extra virgin olive oil. Crisp up that Panko. In a 425 degree oven until it’s nice and crispy. So we’re going to start with a dressing component of our turkey salad. And we have 2 to 3 avocados here depending on their size. I’m just going to go around, pop out the pit, score that flesh, and then scoop it with a spoon. To our avocado I’m going to add some fresh lemon juice, and then a teaspoon of Dijon mustard and then either Greek yogurt or mayonnaise. About a fourth cup. And then we’re just going to mash all that together. So we are going to very thinly slice and shave these raw Brussels sprouts. These are delicious, nice, crunchy, and super fresh. We’re going to take those shaved Brussels sprouts and just toss them in. 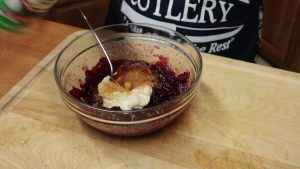 to this I’m going to add some dried cranberries, I love these so I’m going to add half a cup or so. And for some more crunch, chopped pecans, about the same amount that we did the cranberries. And we’re ready for our turkey. I’m just going to break apart our roasted turkey that we have left over. And let’s salt and pepper this. 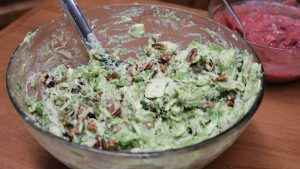 If you like yours to be creamier you can always adjust the Greek yogurt or add some more mayonnaise. Give it a stir. Here’s a really simple dipping sauce that is going to double as a spread for our sandwich. I have some leftover cranberry sauce. This is the whole berry kind, both would work. To this I’m adding some olive oil mayonnaise, 2 to 3 tablespoons and for some optional heat, a squirt of sriracha, and a little bit of Cajun seasoning. So we are ready to bring this dinner on home. The first thing we’re going to do is dish up our delicious soup. And it’s super creamy, has beautiful golden color. You could top this off with a little bit of parsley. You could also put some bacon on here to be delicious, or just a little bit more nutmeg or toasted pecans. 20 minutes in the oven. Serve with spicy cranberry sauce on the side. And lastly, you could dish this up all by itself, our cranberry avocado turkey salad with Brussels sprouts, but since it’s the holidays and we’re being super-decadent, we’re going to finish this off with cranberry sauce, slices of creamy Brie cheese, and that crunchy avocado turkey salad. You could even grill this if you wanted to. Let’s see if we can smush it all together. And we’re ready to dig in to our redesigned Thanksgiving day feast. Thanks so much for joining me. Be sure to check us out at RadaCutlery.com or subscribe to our YouTube channel where you can get more great recipes just like this one.